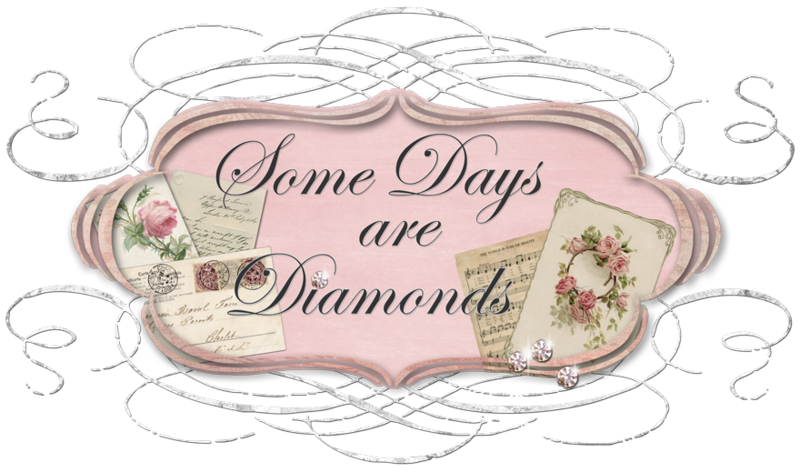 Some Days Are Diamonds: Happy First Day of Spring! Wow! Long time no talk to! So today - being the first day of Spring and all - I came down with a little case of spring fever. And so I took the initiative to venture up into the storage rafters of our garage by myself. Yes! I know! That's what husbands and sons are for. But hey - I wanted my boxes NOW! Now I had never been up there since we had it all built when we bought the house 5 years ago. So this was quite an adventure. which needs to be backed out of the garage to extend the pull down ladder. Now over my car and the entire Harley garage - well . . . that's all my Christmas decorations. Over the Jeep side of the garage - that's every other Holiday's decorations. And over the workshop - well . . . thats JUNK! Precious junk I can't bear to part with. Yet. Give me time. I need to go through it all. No rush - plenty of space. HA! But I'm very organized and everything is well labeled. and man it killed my knees crawling around! Crawl up and venture left and . . . I almost died! We put the garage lights and laundry room light on timers because the boys kept leaving them on all night. I guess I should've thought of that before I went up there. Our garage has no windows - nada, zip zilch, zero. PITCH BLACK!!!! Thankfully I had my digital camera and just kept taking pictures and got backed out and back down the ladder by using my flash! OK, so I won't be going back up there again any time soon. I grabbed the 3 boxes marked Easter and was outta there! Get it all unpacked and spread out on the dining room table, and then . . . hmmmmmm. There is stuff missing. Actually lots of stuff missing. Oh UGH! Gotta go back up - there! Flip the timer to ONE HOUR . . . So here are a few of my favorite Spring and Easter decorations. This is one of those little ceramic houses you put the tea-lights in. It is called Cottontail Cottage. And I have two different size eggs by the same artist also. I love them!! These are two paint cans I bought for the boys when they were in elementary school. (Horrible idea for Easter Baskets!) But they sure are cute! But I have already confessed to being a dish-a-holic! My center piece. It's a platter and a honey jar with a little spring arrangement. It is so bright and colorful that it just makes you smile when you look at it. Oh and my wine cart! It makes me smile too! Please share your favorites with me! I love peeking in everyone's homes and seeing what they have and how they put it all together. I'll finish up tomorrow, and post the rest then. For now I need to go run some errands . . . it just never ends!